Backhaul is one of the major contributors to the high costs of building out and running a mobile network. This is true whether the mobile operator owns the transport links or leases lines from a local carrier. It also applies if the carrier is deploying a dedicated transport segment for 3G or planning to integrate several generations into the same platform. 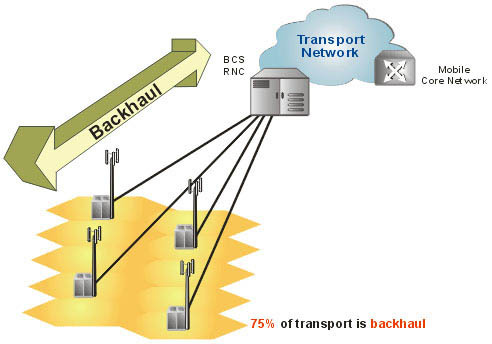 Industry consensus indicates that transport equipment accounts for 25% of the costs of building out a private cellular backhaul infrastructure whereas, in the case of leasing services, transport outlays vary between 40-60% of the total cost of renting lines, with backhaul contributing 75% of this. This is compounded by the fact that the backhaul access network spans the entire coverage area. Considering the huge impact that backhaul has on operating expenses (Opex) and capital expenses (Capex), mobile operators would be well advised to carefully review their cellular backhaul strategies before making further network infrastructure investments. While prudence is always good counsel, it is particularly worth heeding during this era of rapid transition. Complicating the equation, network operators must now be able to support simultaneously the divergent technological demands and applications of existing 2G/2.5G networks as well as those of newly emerging 3G operations. This migration from 2G circuit-switched networks (TDM) to 3G packet switched networks (ATM and eventually Gigabit Ethernet, IP, and MPLS) raises new challenges. In particular, the mobile network operator must weigh the cost, suitability and availability of the access platform chosen to handle the expected increase in bandwidth capacity and be able to manage the complexities of a converged voice and data network.